This product is very useful because of size of the phone, good for handling . A57 have excellent camera quality on both sides, the screen response is very sensitive than other phone. Another good point is that the this phone is looking great. Using OPPO A57 for four months. No issue found. Nice product. Purchased Oppo A57 three months ago. Full HD display, handy and comes with metallic frame. Excellent camera and surprising battery life that lasts full day. the screen response is very sensitive than other phone. The Oppo A57 sports a 5.2-inch HD IPS display. The phone gets 32GB of internal storage which is further expandable up to 256GB with a microSD card. The Oppo A57 also flaunts a front fingerprint scanner with a hydrophobic zirconium surface which makes it work even when your fingers are moist. microSD limit option, as it uses SIM 2 slot. I really like this phone. I am using it currently and I am really happy with it. It&apos;s very smooth and the interface is very user friendly. I have used this phone for 5 months now and it has been a great experience . 1. Selfie camera is not as expected . 2. The phone overheats alot . 39 Pricebaba users have written their experience with Oppo A57. If you own Oppo A57, please do leave your feedback too. Lowest price of Oppo A57 price in India starts at Rs. 11,690 Oppo A57 is available on Flipkart at Rs. 13,500 and on Amazon at Rs. 11,690. Prices updated on 21st April 2019. 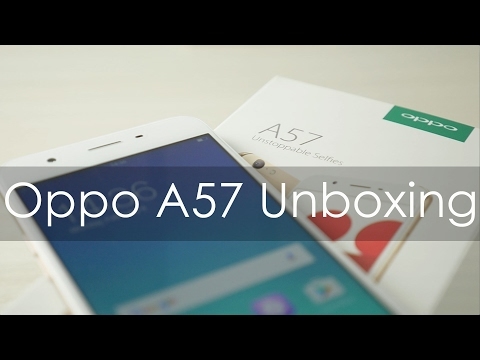 Oppo A57 is a new selfie phone from Oppo which comes with a shining tagline of “Unstoppable Selfies”. The Oppo A57 is the first phone from the company to be launched in India for the year 2017. It gets an all metal unibody design with a fingerprint scanner integrated right into the home button. The phone features a single speaker grill along with a 3.5mm audio jack and a micro-USB port at the bottom. Overall, the phone gets a premium look with decent specs. The Oppo A57 sports a 5.2-inch HD IPS display with a resolution of 1280 x 720 pixels with Corning Gorilla Glass 4 protection on the top. The phone also gets a 2.5D glass over the display. It is powered by an octa-core Qualcomm Snapdragon 435 processor clubbed with 3GB of RAM. It runs on ColorOS 3.0 on top of Android 6.0 Marshmallow. The phone gets 32GB of internal storage which is further expandable up to 256GB with a microSD card. On camera front, the Oppo A57 sports a 16-megapixel front camera equipped with the all new Beautify 4.0 mode which helps you to capture better looking selfies. The front camera is also capable of capturing selfies with bokeh effect and supports hand gestures. The phone gets a 13-megapixel rear camera with PDAF and an LED flash. The phone packs in a 2900mAh battery which provides 11 hours of continuous video watching or 23 hours of talktime. The Oppo A57 is a dual SIM phone and supports Nano SIM in both the slots. The phone also comes with 4G VoLTE support and includes other connectivity features like WiFi 802.11 b/g/n (2.4GHz) and Bluetooth 4.0. The Oppo A57 also flaunts a front fingerprint scanner with a hydrophobic zirconium surface which makes it work even when your fingers are moist. The fingerprint scanner works decently and unlocks your phone with just the slightest touch. Ans: Yes, the Oppo A57 supports OTG. Ans: No, the Oppo A57 comes with a non-removable battery. Ans: Yes, the Oppo A57 supports Reliance Jio Network. Ans: It comes with Android 6.0 Marshmallow and hasn't received the update yet.